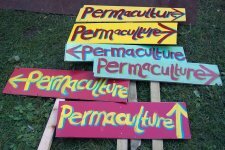 Bursary places are available for the North Herefordshire 2019 Permaculture Design Course at Applewood. Join experienced teachers and authors Chris Evans, Tomas Remiarz and Looby Macnamara to discover how permaculture can enhance many aspects of your life, not just your garden. There are 2 bursary places available for this course for those who would not be able to attend otherwise. 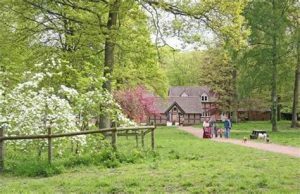 Queenswood Country Park have two new exciting projects which they’d like some help with! They are looking for people to help create a Wellbeing Garden that will showcase wildlife-friendly and sustainable gardening techniques, as well as our ‘Buzz about Queenswood’ project, which will create habitats for pollinating insects. You’ll be able to take part in a range of gardening and habitat creation activities, with no previous experience needed. Hopefully you’ll enjoy being outdoors in a place of natural beauty, learning new skills and forming relationships with others in a friendly environment. All travel and parking expenses will be reimbursed. There’s also a woodstove heated yurt to keep you warm and sheltered whatever the weather! If you’re interested in getting involved, you can either turn up at 10am on Mondays, meeting outside Queenswood Visitor Centre, or contact Katrina on 01432 530088 or David on 01432 372404 for more information. Our next Network Gathering will be a pop-up cinema! Alice, HGN member has been wanting to show this film in Herefordshire for a while and we are finally showing it – thanks to A Rule of Tum for hosting at their Bookshop Restaurant. In Our Hands is the story of what small farmers are doing for the future of our food system post-Brexit. There is a growing movement of farmers and food workers who are creating vibrant farms, living soils, thriving food markets and a fairer food system for all. 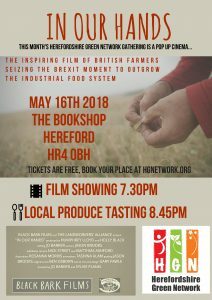 Herefordshire Green Network is proud to be promoting this film, and looking forward to bringing local farmers together alongside the people that eat their food every day. Despite recent changes, this county still has a high percentage of small to medium size farms, plus many people who would like to be farming on a smaller scale. We hope this film will feed into conversations about food production for farmers and small-holders alike. Please spread the word on Facebook Instagram and Twitter – thanks! This is being shown as part of two HGN events celebrating land and farming in May: the other is Three Acres and A Cow, a show touring the country connecting the Norman Conquest with fracking, Brexit and everything in between. It’s been getting rave reviews and we’re proud to have it here in Herefordshire at Canon Frome Court on 13th May. Come to a right romp through history next weekend! 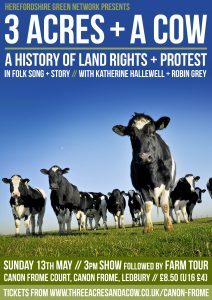 ‘Three Acres And A Cow’ connects the Norman Conquest with current issues like fracking and Brexit via the English Civil War, Industrial Revolution and plenty more besides – through songs, stories and poems. Learning from nature and applying this learning in a way that resonates with Permaculture practice, Gabe Brown is one of the pioneers of the current soil health movement that focuses on regenerating resources. His family own and operate a diversified 5,000-acre farm and ranch near Bismarck in the USA, but provide plenty of food for thought for farmers and growers around the world. With thanks to Frank Hemming for the link. For several years, Marcher Apple Network (MAN) has run a grafting course; it has been a superb day of training in grafting skills. Participants took four grafted trees away; reports mention these babies are growing vigorously. And we’re running another on this year! Tom Adams, who is a very experienced horticulturalist https://www.tomtheappleman.co.uk/ with many years of growing and tending fruit trees, will provide guidance. If you’re interested in joining the fun, and learning too, do please book early for this. There are about twelve places. You should bring with you a pair of secateurs whilst other course materials will be provided. (You are welcome to bring your own grafting tools and graft wood if you wish). Yes, and please think where those four (yes, four!) trees you graft will be planted next winter. The course will be held on 18th February from 10.00 to 15:00 at Cusop Village Hall, HR3 5RW, Grid reference SO 23340 42362 via http://gridreferencefinder.com/ with a light lunch taken at a local pub or café in Hay-on-Wye. (Lunch is not included in the course fee). The Organic Research Centre, a leading independent research charity, has launched the new Dean Organic Fund at the Oxford Real Farming Conference. The fund offers interest-free loans, typically ranging from £5,000 to £25,000, to small-scale organic/ecological growers and food businesses. The Dean Organic Trust was established in 1993 by Jennie Bone and following her death in 2016, the Dean Organic Trust’s assets and a legacy from Jennie Bone’s estate were transferred to the Organic Research Centre to create a significantly larger Dean Organic Fund. The Organic Research Centre is inviting applications for interest-free, unsecured loans from organic farmers and food producers who wish to expand their enterprises by investing in equipment or stock or would benefit from other working capital. The fund is also open to those producers that are not certified organic but whose operations are closely aligned with organic principles. The loans are repayable over periods of up to five years and applications are welcome from companies, sole traders, community or social enterprises and charity-owned businesses. Further details and application packs are available through the Organic Research Centre’s website: www.organicresearchcentre.com or by email to Nic Lampkin on nic.l@organicresearchcentre.com. One of the outcomes of our HGN Food Rescue discussions on Wednesday last week at the HGN Gathering was an interest in Gleaning.